How A Young Man From War-Torn Germany Found His Utopia On The Other Side Of The World. Continuing the story of Arno Josef Zapf born 3rd July 1932 in Staffelstein, Bavaria, Germany. See here for Part One, if you missed it or just want to refresh your memory. 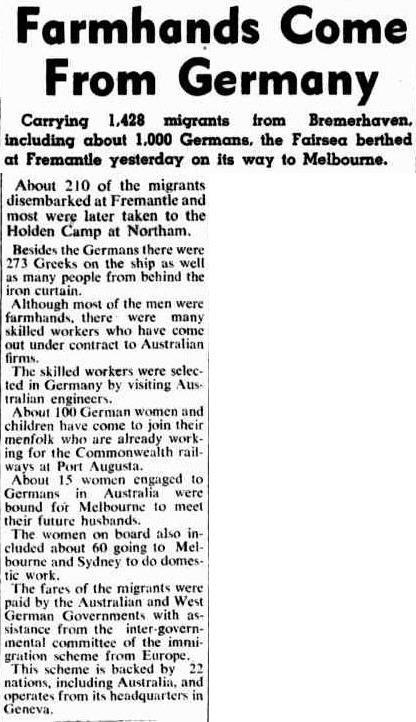 The fares of the migrants were paid for by the Australian and West German Governments with assistance from the inter-governmental committee of the immigration scheme from Europe. This scheme was backed by 22 nations of the world, including Australia and it operated from its headquarters in Geneva. As part of the conditions, he undertook to regularly attend the nearest free night class made available by the Australian Government for the purpose of providing migrants with instruction in the English language. Clearly from the extract shown (below) he was thought of as a "Good strong type" by the person assessing his application. He also had to supply referees in relation to the work he had been engaged in. There is a notation in black that indicates he was working in "house construction work". Given the post-war building boom that was occurring in Australia at this time, It always surprised me that they didn't accept his recent qualifications as an Electrician. The reason why he left his work is also noted as "Arbeitslos" or in English, "Unemployed". Jobs had become harder to find, Arno and his sister Brigitte were both unable to work in Germany. Brigitte also emigrated, to Canada, she currently lives in Montreal. Once this report had been received, Arno was then referred to have a chest x-ray to check for tuberculosis or TB as it was often referred to. A local doctor also assessed him for general health issues too. Arno then had to wait for the "stamp of approval" to be accepted, to come to Australia. Once it arrived, it wasn't long before he was ready to leave his home, his siblings and his parents, his family support network. The ship landed in Fremantle, Western Australia on 18th October, where Arno disembarked. He was then taken to Holden Migrant Holding Centre/Camp for processing. This centre was located 96km (60 miles) from Perth. What happens to Arno next...??? Where does he go and what adventures are ahead for him? This story continues in part three, was this the 'Utopia' he was dreaming of?? ?